Apart from Him we can do NOTHING. Do we believe that? I am on break between semesters. I love living my days without the clock ticking in my head, not having to have everything done by a certain time or accomplished within a specific time-frame. I have been especially enjoying my less rushed times with God. I am powerless except for you. This statement is based on John 15:5: I am the vine; you are the branches. If you remain in me and I in you, you will bear much fruit; apart from me you can do nothing. Because I had time, I paused and pondered. Apart from Him I can do NOTHING. I thought of all the mornings this past semester when I failed to purposefully connect to the “vine,” Jesus; when I bounded out of bed and started getting things done without first connecting to Him and His power, when I did not hand Him my schedule and invite Him to use it for His eternal purposes. On such mornings I rolled out of bed and checked student e-mails first, or read my Bible casually without being conscious that I have no power apart from Him. Truth is, there are still days when I am tempted to think I don’t need Him quite as much as other days, like when I am teaching a fine-tuned and well-practiced lesson — one I have taught a million times before. Or perhaps on a Saturday when I don’t think I need God quite as much to attend my son’s lacrosse game and chat with parents on the sideline. I did such days without His power. Perhaps you too have done the same. Today is our reminder that we can’t leverage any of our actions or words to bear fruit for the glory of Jesus. We can’t make our children turn out well. We can’t make people enjoy our company. We can’t make our words have influence. We can’t even guarantee our car will start when we turn the key. We have no power to make anything specific happen because of what we do or say. Here is the entire paragraph that follows today’s featured sentence: I am powerless except for you. Perhaps you can join me in starting each day this week desperate for Him because we understand that apart from Him we can do nothing. Imagine what God will do with all the power we are inviting from heaven to earth! I am powerless except for You (John 15:5). I invite Your power to work miracles today (and tonight while I sleep) and to spin everything about my life for Your glory, Your kingdom, and Your eternal story. I expect magnificent results because You are magnificent. Do not let Your amazing grace by wasted on me. Enjoy His power this week, my dear readers. 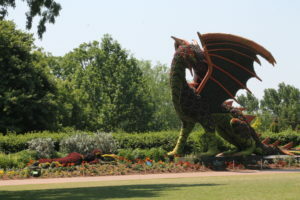 Picture Explanation: In a POST two weeks ago I featured flowers from The Botanical Garden when I visited with a friend. 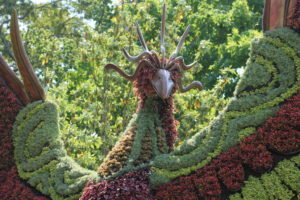 In addition to the flowers, topiaries are the seasonal feature at this time. 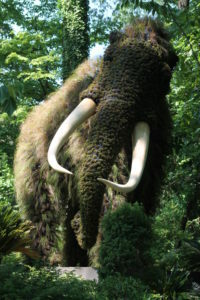 (I thought the mammoth was coming to get me through those woods!) 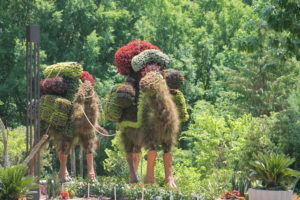 My friend learned the topiaries are trimmed and tended to every day in order to maintain their maximum beauty. Imagine how well our lives are tended to when attached to our vine, Jesus. This blog post came at a perfect time as I was depending on the Lord at a family gathering. Without Him, I am powerless. I needed His strength and power to flow through me to love in a way that would bring him pleasure. Thank you for your post and timely reminder that we can’t do anything of eternal value apart from Him.